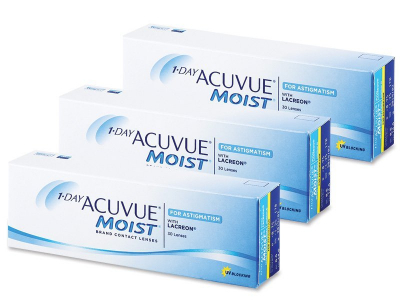 1 Day Acuvue Moist for Astigmatism are daily disposable lenses designed with LACREON technology, which helps moisturise the lenses for enhanced comfort. ASD technology and UV filters also help provide greater comfort and protection. Johnson & Johnson presents a new daily disposable contact lens for astigmatism within their 1 Day Acuvue Moist range. The contact lenses feature the brand's exclusive LACREON™ technology for a wide range of parameters. According to the Johnson & Johnson, the lens has a 95 % first-fit success rate among users. Read more about 1 Day Acuvue Moist for Astigmatism. well worth the price for the comfort and convenience. Probably the best toric lenses I´ve tried. They suit me best. these seem tp be what i'm looking for but I am dubious about buying 3 months supply. Is there a small trial pack I can try first?